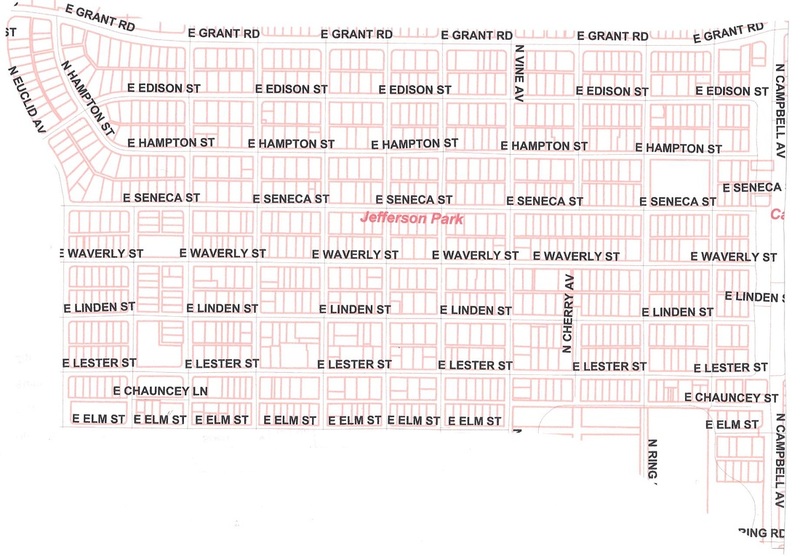 Tucson's 31st Historic District is a neighborhood bounded on Grant Road on the north, Euclid on the West, Campbell Avenue on the East and Chauncey Lane on the South. It is a vibrant historic urban neighborhood. Located in the shadow of the U of A, its residents are a mix of owner-occupants and renters. The neighborhood includes three churches and the International School of Tucson, serving students from pre-school to eighth grade. Walkable and bike-friendly streets, green infrastructure, and friendly neighbors make Jefferson Park one of Tucson's premier neighborhoods. 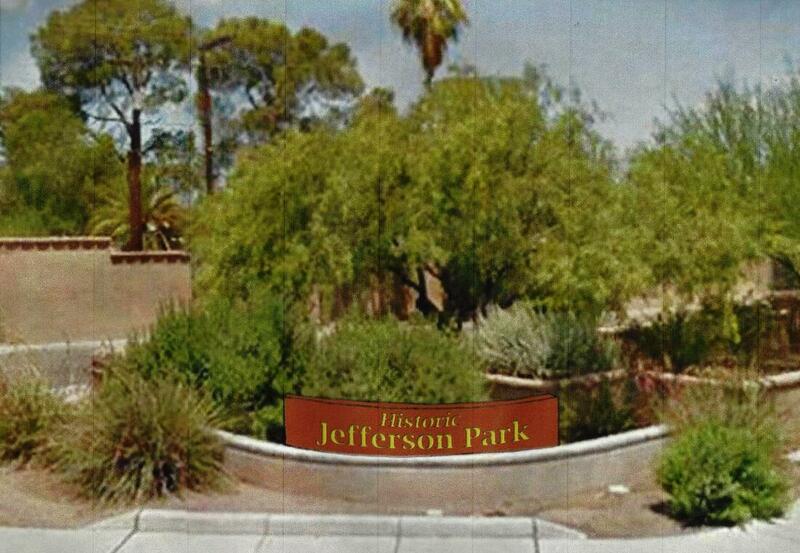 Jefferson Park has no Entrance Signs! Treehouse Designs has prepared suggested plans. It proudly celebrates the neighborhood's historic status. If it is to be it is up to us! For a donation form CLICK HERE. The donations are made to the neighborhood non-profit which is a 501c3 organization and donors will receive a receipt and be recognized. Businesses who contribute will be thanked in the Jefferson Park E-news and on this website. Traffic circle at Linden and Cherry to mitigate flooding and speeding - Funded by Jefferson Park Neighborhood Assn, the Friends of Jefferson Park, Inc and the generous private donors of Jefferson Park Neighborhood. Completed March 2019. Congratulations neighbors! Thanks to our neighborhood supporters. Mark's continued support for Jeff Park concerns. May your retirement be all you hoped! Multi-neighborhood meeting with TPD representatives discussing the current crime and safety issues for the neighborhoods.
. . . .Safety. . . .
GET THE NEIGHBORHOOD E-NEWS! Receive updates on neighborhood issues in your inbox. Sign up for the Jefferson Park E-news. Click Here. GET ON THE LIST SERVE! If your property qualifies as a contributing property you may apply for the property tax break! Describes the neighborhood plan by which the city has agreed to abide. ​This is your neighborhood 501c(3) non-profit. Your donation is tax-deductible. You will receive a receipt for tax purposes. phone #'s, websites-reporting code violations, senior help, neighborhood contacts etc. Click Here to print the page. Consider allocating your AZ Tax Credit to our own neighborhood school, The International School of Tucson. You can mail your donation by printing the form click here. ​ Or you can do the process on line at: https://www.ibescholarships.org/Donations.aspx . You will receive a receipt.